Chiellini's shoulder will not distract from what was frankly an abysmal performance by Italy at this World Cup. There is very little that is redeemable, and a lot that is regrettable. After the victory against England, there was premature but palpable optimism of going all the way. Given England's subsequent performances in their next group games, that optimism proved embarrassingly misplaced. The English were the true whipping boys of the group, failing to gain even a consolation win against Costa Rica in their final game, and Italy's win against Roy Hodgson's charges in the opener signified very little. Yet now with all the sums done, it is still hard to comprehend how Italy failed not only to record a victory over Costa Rica or Uruguay, but also to score against them in over three hours of play. The failure is so comprehensive that it is difficult even to know where to start the inquest. Cesare Prandelli resigned as coach right after the defeat, and so did federation president Giancarlo Abate. Gianluigi Buffon and Andrea Pirlo have now played their last World Cup. Daniele De Rossi is now thirty-one. And the successors? Mattia De Sciglio, Marco Verratti and Lorenzo Insigne are all promising but are not yet world class. This transition will be painful and will require a radical reimagining. 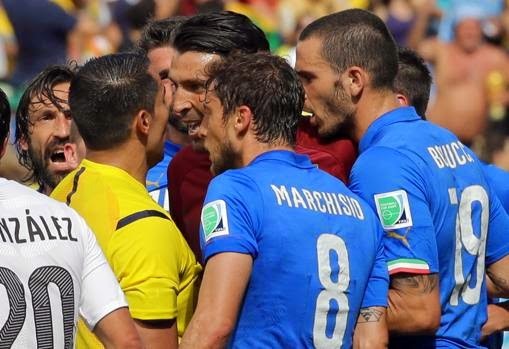 Buffon dubbed the exit as "deserved," while De Rossi said that "real men need to play in the national team, not Panini stickers or characters," referring to Mario Balotelli's most recent gag. Sure, the latter's opinion was clunky in expression, but he was transparently frustrated at the lack of tenacity from players who were, we were told, fine-tuned for the occasion. And we may as well talk about Balotelli, who ghosted in and out of the tournament, bristling and collapsing from the slightest touches. There are no excuses to be made anymore for the less-than-super Mario. His movement, his touches, and his conduct are absolutely unacceptable. There are only criticisms for Italy, unfortunately. From the starters to the substitutes to the coach, this was a colossal failure. Prandelli changed his line-up in all three games, but he made no impact. His meddling was symptomatic more of panic than a plan. "I take responsibility for the failure of this technical project," said Prandelli with his usual disarming grace. Indeed, the project unraveled in the worst possible way in the Brazilian heat. It was as if these players had not played with each other ever. The project's failure will hopefully prompt the clubs to cooperate more with the national team coach, something that Prandelli had been demanding for a while. For now, there is only uncertainty. Given that Serie A is also struggling in Europe, the questions facing Italian football are complicated and innumerable. It feels like too many generations playing together. They brought too many classics to the jungle. Out of sync.